Bruno Vlahek with his wife Dubravka Vukalović. Photo by Marko Pletikosa. Letovanić, Letovanić, selo pokraj Kupe! Pianist and composer Bruno Vlahek has distinguished himself as one of the most prominent and versatile musicians of his generation; being praised by the critics for his "fantastic virtuosity" and "depth of musical thought that bewitches the audiance". Born 1986 in Zagreb (Croatia), it was there that he received first piano lessons at the age of 9. He is also active as a concert organist and composer. His music has been performed on five continents in cities such as New York, Chicago, London, Berlin, Amsterdam, Cambridge, Lisbon, Prague, Vienna, Salzburg, Moscow, St. Petersburg, Seoul, Sydney and Zagreb. Pianist and composer Bruno Vlahek has distinguished himself as one of the most prominent and versatile musicians of his generation; being praised by the critics for his "fantastic virtuosity" and "depth of musical thought that bewitches the audiance". Born 1986 in Zagreb (Croatia), it was there that he received first piano lessons at the age of 9. Only two years later, he already won the 1st prize at the Pinerolo International Piano Competition in Italy and became subsequently a two-time absolute winner at his native country's national competitions in Dubrovnik. He graduated as one of the youngest students in history of the Zagreb Music Academy with Vladimir Krpan, obtained a soloist diploma at the Haute École de Musique in Lausanne with Jean-François Antonioli and received his master's degree with Vassily Lobanov at the Hochschule für Musik Köln, where he also studied composition and improvisation. From 2010-13 Bruno studied with legendary Russian pianist and pedagogue Dmitri Bashkirov at the Queen Sofía College of Music in Madrid, as a scholarship holder of the Spanish Foundation Albéniz. Bruno was awarded 1st prizes at the international piano competitions „Alexander Scriabin“ in Paris 2010 and „Ricard Vińes“ in Lleida 2008; was laureate of the 6th China Shanghai International Piano Competition 2012 and EPTA-Svetislav Stančić Competition in Zagreb 2007. In his native country he received a prestigious title of the Young Musician of The Year 2010, awarded by the Zagreb Philharmonic Orchestra. He is also the winner of the Swiss prizes "Paderewski" and "Max D. Jost", the Yamaha Music Foundation's Award in Madrid, Pnina Salzman Memorial Award in Israel and Arists on Globe Award 2014. For his achievements he was awarded ny Honorary Diploma from the hands of Her Majesty Queen Sofia of Spain. Big impact on Bruno's piano career were the contacts he had with artists such as Einar Steen-Nřkleberg, Jean-Bernard Pommier, Menahem Pressler, Ferenc Rados, Masaaki Suzuki and Gábor Takács-Nagy. He regularly appears as a recitalist and soloist with leading orchestras in Europe, Asia, Africa, South America, Russia and Israel - in prestigious concert venues such as Palau de la Música Catalana in Barcelona, Auditorio Nacional de Música in Madrid, Franz Liszt Academy in Budapest, Mozarteum Salzburg, Tel Aviv Museum of Art, Shanghai Concert Hall or Seoul Arts Centre. He performed at the festivals such as Dubrovnik Summer Festival, Busoni Festival in Bolzano, Music Biennale Zagreb, Verano de Palma de Mallorca, Dar Smile Music Festival in Tanzania, Greta Erikson's Festival in Sweden and the Vladimir Spivakov's Festival in Moscow among others. In 2012 he was invited to take part at the famous Verbier Festival Academy in Switzerland. He toured China three times and performed in some of the country' finest venues to great critical acclaim. He will return to China again in the season 2015/2016. His performances were broadcasted worldwide on TV and radio stations such as British BBC 3, Dutch NPO Radio 4, Spanish Catalunya Rŕdio or Radio Suisse Romande, for which he recorded Saint-Saëns' 2nd Piano Concerto with Orchestre de Chambre de Lausanne. He collaborated with conductors and chamber music partners such as Leopold Hager, Milan Horvat, Jaime Martín, Pascal Rophé, Alexander Ghindin, Cyprien Katsaris and Viktor Tretyakov. He performs with great success with pianist Dubravka Vukalović as D&B Piano Duo. In 2013 they were prizewinners of the 1st International Competition for piano four-hands in Monte-Carlo. He is also active as a concert organist and composer. He has written more than 40 orchestral, chamber, solo and choral works of various genres, mostly characterized by neoclassical form and expression, often combined with idioms of jazz and popular music. In significant number of his compositions is shown special interest for sacred music. His music has been performed on five continents in cities such as New York, Chicago, London, Berlin, Amsterdam, Cambridge, Lisbon, Prague, Vienna, Salzburg, Moscow, St. Petersburg, or Seoul, and at the ISCM’s World New Music Days 2010 in Sydney (Australia). In December 2012 he won the first prize at the XXXIII International Composition Competition for Organ Works "Cristóbal Halffter" in Spain. His works have been awarded by the Ministry of Culture of the Republic of Croatia and have been published in United Kingdom and USA. 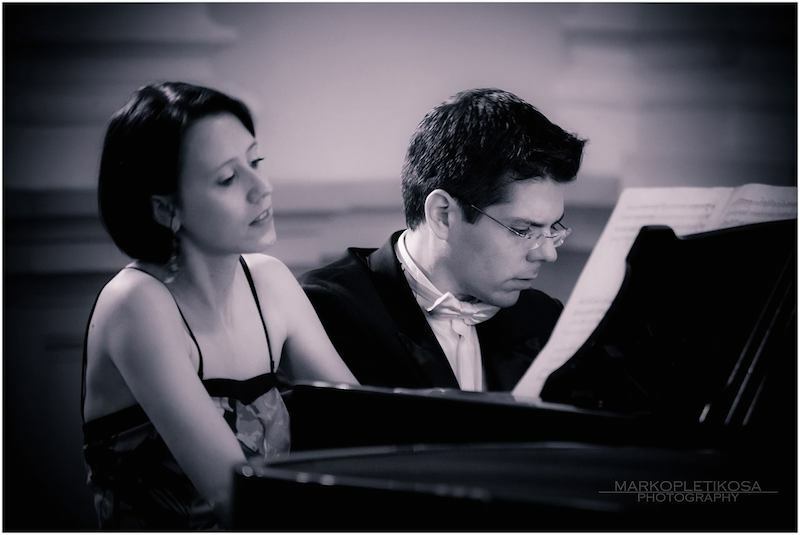 Passion for piano and creativity of playing together brought Dubravka Vukalovic and Bruno Vlahek together into D&B Duo. Their first concert as a duo in Lausanne in 2006 was an instant success and was praised for extraordinary performance of two piano works by Rachmaninov and Bernstein. Having met during their soloist studies at the Lausanne Conservatory of Music, they have been guided in duo playing by Swedish pianist and chamber music expert Dag Achatz. Since then, their popularity is constantly growing by series of appearances in cities such as Amsterdam, Berlin, Budapest, Dubrovnik, Palma de Mallorca, Madrid or Monte-Carlo – where they became laureats of the Monaco's 1st International Competition for Piano-Four Hands in 2013. In the same year they made their Asian debut, having performed in some of the finest concert venues of China, where critics highlighted the „brilliant virtuosity of their dialogue“. They were first Croatian pianists to perform monumental cycle "Visions de l'Amen" by Olivier Messiaen which they presented at the 50th anniversary of the Music Biennale Zagreb. In their repertoire, which consists of original works and arrangements for piano four-hands and two pianos, important place have works of living composers, some of which are dedicated specially to them. Dubravka Vukalović was born 1984 in Varaždin where she received her first music education from professor Olimpija Vojvoda at the Varaždin Music School. She continued her education at the famous Central Music School of Moscow's State Conservatory P. I. Tchaikovsky in the class of Alexander Mndoyants. Afterwards, recognized as a special talent, she got admitted directly to the third year of studies at the Lausanne Conservatory of Music in the classes of Dag Achatz and Jean-François Antonioli. In 2010, she obtained her master degree in the class of famous Brazilian pianist and conductor Ricardo Castro as a scholarship holder of Swiss Foundation Max D. Jost. For many years, her academic and artistic projects were supported by Foundation of British Family Hallam. Furthermore, contacts with artists and pedagogues such as Rudolf Kehrer, Anatoly Katz, Jean-Bernard Pommier, Ralf Gothóni and Evgeny Mogilevsky had an important impact on her career. She gave her debut at the age of 14 as a soloist with Zagreb Philharmonic Orchestra and subsequently won the first prize at the Zlatko Grgošević international piano competition in Zagreb in 2000. She regularly performs as a soloist and chamber musician throughout Europe, in Asia, South America and Russia. In 2009, she performed at the prestigeous festival of contemporary music "Archipel" in Geneva in duo with renowned French violist Christophe Desjardins and collaborated with Swiss-French ensemble "Namascae" and maestro Eduardo Leandro. In the same year, she appeared as a soloist in Ravel's Piano Concerto with Bahia Symphony Orchestra in Brazil. Her concert appearances were recorded and broadcasted on TV and radio stations in Croatia, Netherlands, Russia, Spain and on Radio Suisse Romande (Espace 2). 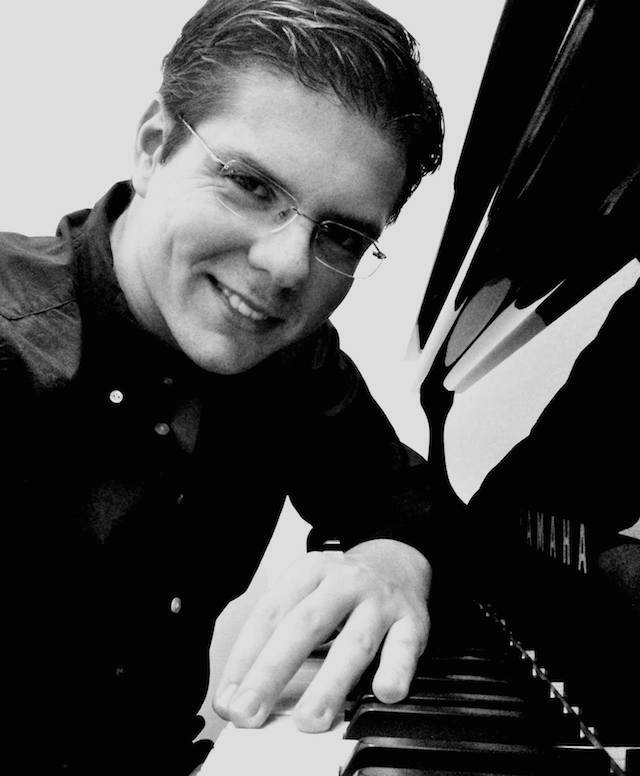 Bruno Vlahek was born 1986 in Zagreb where he graduated piano with Vladimir Krpan as one of the youngest students in history of the Music Academy. He pursued postgraduate studies at the Conservatoire de Lausanne with Jean-François Antonioli and at the Hochschule für Musik in Cologne with Vassily Lobanov, where he also studied composition and improvisation. From 2010-13, he was guided by legendary Dmitri Bashkirov at the Queen Sofía College of Music in Madrid. Vlahek won the first prizes at the international piano competitions „Alexander Scriabin“ in Paris 2010 and „Ricard Vińes“ in Lleida 2008; was laureate of the 6th China Shanghai International Piano Competition 2012, received a title of the Young Musician of The Year 2010 in Croatia, and won prizes such as Swiss Prix Paderewski, Yamaha Foundation's Award in Madrid, Pnina Salzman Memorial Award in Israel and Artists on Globe Award 2014. For his achievements he was awarded by the Honorary Diploma of Her Majesty Queen Sofía of Spain. He regularly gives recitals and appears with leading orchestras throughout Europe, in Asia, Africa, South America, Russia and Israel. He performed in prestigious halls such as Palau de la Música Catalana in Barcelona, Liszt Academy in Budapest, Auditorio Nacional de Música in Madrid, Gasteig in Munich, Mozarteum in Salzburg, Tel Aviv Museum of Art, Shanghai Concert Hall, Seoul Arts Centre, and at the festivals of Bolzano, Dubrovnik, Vienna, Moscow, Palma de Mallorca, Dar es Salaam and Verbier. His performances were broadcasted on TV and radio stations such as British BBC3, Dutch NPO4 Radio, Catalunya Rŕdio or Radio Suisse Romande, for which he recorded Saint-Saëns' 2nd Piano Concerto with Orchestre de Chambre de Lausanne. He has composed more than 40 orchestral, chamber, solo and choral works of various genres which have been performed on five continents in cities such as Chicago, London, Berlin, Amsterdam, Cambridge, Lisbon, Prague, Vienna, Salzburg, Moscow, St. Petersburg or Seoul, and at the ISCM’s World New Music Days 2010 in Sydney (Australia). In 2012 he won the 1st prize at the XXXIII International competition for Organ works "Cristobal Halffter" in Spain. His works have been published in United Kingdom and USA. 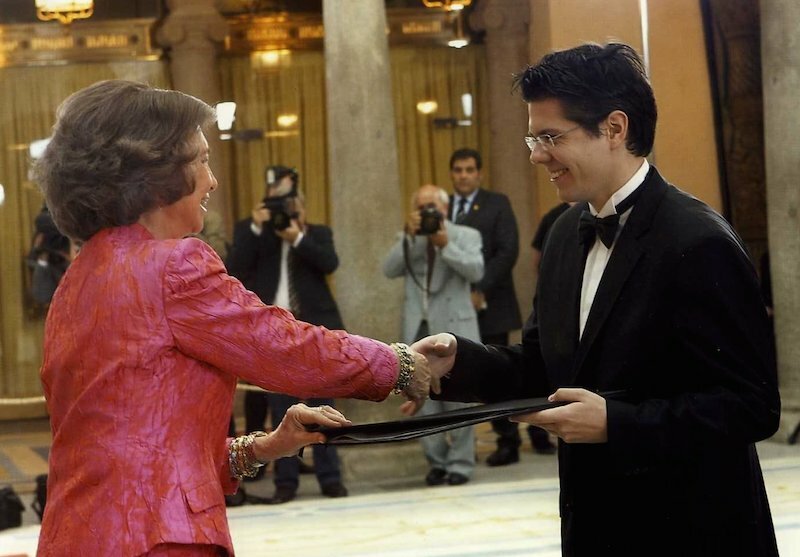 Queen Sofia awarding Bruno Vlahek, Madrid 2010/11. Slovenian choir "Chorus" performing "Salve regina" by Bruno Vlahek.